Heralded as one of the best in the game, Dizaster is one of the most well known battle rappers of all time. As prolific as he is deadly, Diz has amassed an astounding 70 on camera battles, with countless more freestyle battles not caught on film. Representing Los Angeles by way of Toronto, the American battle rapper has gathered quite the following of fans over the years, beginning in the Jumpoff WRC days up until the present day. A former King of the Dot champion, Dizaster has been apart of some of the best known battles of all time, including his showdown with Canibus, his legendary clash against DNA, and various other high profile matches. Known for his ability to mix his written verses with freestyling effortlessly, Diz’s unique style has helped him stand out among the top tier. Back in Toronto to try to reclaim the chain for a second time, Diz goes up against Pat Stay to see if he can take the throne once again. By far one of the most feared battle rappers in the world, Pat Stay has earned his reputation as a heavyweight. 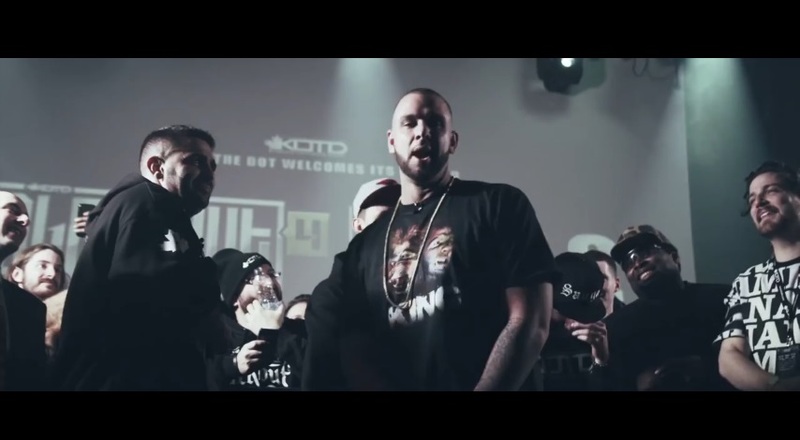 The Nova Scotian emcee has one of the largest fanbases in battling, pushing him to achieve his current status as KOTD Champion. One of the progenitors of the written era of battling, Pat helped grow the movement through his immense success starting out in the Elements League. Now a regular in King of the Dot, Pat has posted some of the leagues best performances in battles against longtime best friend Hollohan, Head Ice, and Math Hoffa. An imposing figure regardless, Pat dominates his competition through a mixture of intimidation, knockout punchlines and decimating bars. Having requested this match against Dizaster, Pat Stay aims to retain his status as champion against a hungry challenger in this next release from King of the Dot. This entry was posted in Dizaster, King Of The Dot, Pat Stay and tagged Battle Rap Lyrics, Blackout 4, dizaster, Dizaster vs Pat Stay Lyrics, king of the dot, pat stay, Pat Stay vs Dizaster Lyrics, Rap Battle Lyrics. Bookmark the permalink.